Each of our children has been given a name that carries with it a godly heritage. Elisabeth was named after Elisabeth Elliot, a woman who has been greatly used by God both as a missionary and a Christian author. Judson was named after Adoniram Judson, the first American missionary to leave the shores of our blessed country. Our third child, who is to be born in just a couple of weeks, has been given the name Emily Faith; and like her older siblings, her name carries with it a godly heritage. Initially, we chose the name Emily to continue the theme of greatly used missionaries of years gone by. We had been discussing various names for several months, but could not settle on one. One evening, I was reading To the Golden Shore (the best biography on Adoniram Judson that has ever been written), and I came to the chapter in which Adoniram meets the lady who would eventually become his third wife (his previous two wives had passed away). Her name was Emily Chubbuck. I thought, "That's the one. Emily it is." Linda immediately agreed. A few days later, I announced the name Emily Faith on Facebook. I received many kind comments, but one comment absolutely gripped my heart. It was from one of our precious friends, Alice Thomason. Her daughter, Emily Crownover, also a close friend, had been battling brain cancer for several years. Emily and her husband, Steve, and their four children have faithfully served at McKee Road Baptist Church in Bakersfield, California, the church where Linda and I were married. Emily's parents, Don and Alice Thomason, also faithfully serve at this church that is so close to our hearts. Emily's physical condition had digressed considerably over the past few months. We were blessed to spend some time with Emily and her family just a couple of weeks before we left for Cambodia, but we felt that may have been our last opportunity to fellowship with her in this life. When we announced on Facebook the name Emily Faith, Emily Crownover's physical condition was worsening. As I looked at the comments that people left on Facebook, I saw the comment from Emily's mother, Alice Thomason. It simply read, "What a beautiful name." My heart was so touched. I promptly responded, "Our daughter is honored to share such a beautiful name with such a wonderful person." The words "wonderful person" certainly describe Emily Crownover. But there are better words to describe Emily: faithful Christian; devoted wife; godly mother; treasured daughter; beloved sister; genuine servant of God, and the list could go on. As soon as I read Alice's comment, I thought, "Not only has our Emily inherited her name from Emily Judson- she has inherited her name from a woman who has had an even greater influence upon our lives than this great missionary of yesteryear." Yesterday, on July 16th of 2011, we received the news that Emily Crownover's struggle with cancer had finally ceased, and that she was in the arms of her Saviour. We pray that our Emily Faith will grow to love Jesus Christ, and serve Him with her whole heart, just as our precious friend, Emily Crownover, did. Emily's middle name, Faith, also has a precious heritage. Every time I hear the word "faith", whether it be in a sermon, a song, or a conversation, my mind takes me back five years to the time that I visited Cambodia for the first time as a single college student. God blessed me beyond measure by allowing me to work with the Benefield family. I was there for a month, and during that time I grew to know and love the Benefields. Candace, Deborah, Emma, Faith, and Stephen- their children, ranging from eight years old down to just a few months- were a special blessing to my heart. Having the privilege of working with this family, combined with the opportunities to get a taste of ministry in Cambodia, proved to be an experience that will forever be etched in my memory. The trip came to an end on July 3, 2006. The entire family accompanied me to the airport to say goodbye. We had about twenty minutes to enjoy our last moments of fellowship at the airport Dairy Queen, and then it was time for me to check in and board the plane. I will never forget this experience as long as I live. I said my goodbyes to Bro. and Mrs. Benefield, and then I looked at the children. I offered Candace, who at the time was eight years old, a hug to say goodbye. She smiled sheepishly and shied away, not daring to give anyone besides her Daddy a hug. I then turned to Deborah, the six year old, and offered her a hug. He smiled shyly and followed Candace. I then turned to Emma, the four year old, and held out my arms for a hug. She giggled a giggle that only Emma could giggle, and followed her two older sisters. Then I turned to Faith, the two year old. Faith had proven during that month that she was not afraid of much. At two years of age, Faith had a personality all of her own. We would say, "She is a character!" In addition to that, she was as sweet as a two year old girl can possibly be- actually, a little sweeter. When I held out my arms to say goodbye, she walked up to me as calmly as could be, stretched out her arms, and gave me one of the best hugs I've ever received. I remember telling Bro. Benefield, "Well, I guess I'll see you in a couple of years, hopefully." I then gave my farewell to baby Stephen, grabbed my luggage, and entered the security checkpoint. It would not be a couple of years before I saw the Benefields again. It would be only a couple of weeks. The day after I left, little Faith became ill with an unknown condition. After over a week of doctor visits, the Lord saw it fit to bring Faith Home to be with Him. I had the privilege of singing in a quartet at Faith's funeral, which was held at Sequoia Baptist Church in Visalia, California. We sang "Living By Faith." I cannot explain the grace of God that was displayed in the lives of the Benefield family during that time. They buried Faith next to her older sister, Bethany. 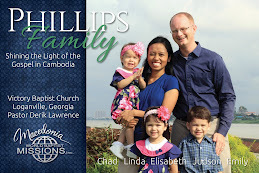 After several months of healing, the Benefields returned to Cambodia, and have been blessed with two more children, Gabriella and Seth. Faith Benefield and her family have taught me indelible lessons about faith in our Heavenly Father. Although Faith was only two years of age, she made an impact on my life that will be felt until I take my last breath. Our daughter, Emily Faith, has been given a name that truly carries with it a precious, godly heritage. Our prayer is that she, Elisabeth, and Judson will grow to embrace the heritage that has been passed to them. Our prayer is that each of them will grow to love and serve the Lord whole-heartidly. Thank you so much for sharing that, Emily Faith is a beautiful name but even more beautiful knowing the story behind it! Thanks for the memories. Very touching. Looking forward to meeting our Faith's little namesake. Living-fields.com contains our video presentations, our testimonies, our statement of faith, and other information about our ministry in Cambodia. Take a few minutes to check it out! By the grace of God, I am a church-planting missionary to Cambodia. I have a beautiful, godly wife, Linda, and three precious children, Elisabeth (5), Judson (4), and Emily (born Aug. 17, 2011). I taught junior high and high school at First Baptist Church School in Long Beach, California for two years, and now my family and I are church-planting missionaries in Ta Khmau, Cambodia. We are sent out of the church that I grew up in, Victory Baptist Church of Loganville, Georgia. We are blessed to be assisted by Macedonia World Baptist Missions. "Do You Have Any More of Those...?"